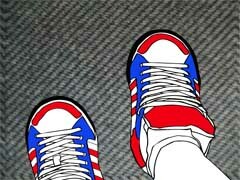 Posted by StephB on Monday, December 15th, 2008, at 12:04 pm, and filed under animation, footwear. I really like this piece. Simple concept executed with style and technical apptitude. I love the combination of real life images and animated drawings. I feel that this is a real breath of fresh air for the vlog site. this is such a nicely produced piece, again i love the animated image against the real life images! Mir gefallen die vielfältigen Hintergründe, die du hinter die Schuhe gelegt hast…..